While it looks like a simple social media location shot, this was part of a week-long campaign for the airline ANA that was shared on social media and used in print. For this campaign, Pei Ketron was hired by the airline to showcase the many destinations served by ANA. For some photographers trying to make their career on social media, the idea of becoming an “influencer” has a special lure thanks to the heavy emphasis clients are putting on reaching the social-media-entrenched Millennials and the globe-trotting lifestyle some seem to enjoy. But as with many things in today’s media landscape, the reality of the situation is different than it appears at first glance. The logic of the influencer goes like this—ad-saturated consumers don’t trust print and TV campaigns, but they do trust the subject-matter-expert photographers on Instagram and Snapchat and other tools because of their authenticity, and so these people possess the power to suggest products and bypass the skepticism consumers show toward traditional ads. The result has been a rush for clients to find photographers with massive followings and use the trust between them to casually sell a product or experience. For photographers, there’s been an equal rush to gather large followings and to leverage those numbers to be seen as an influencer, worthy of a showering in ad dollars. The truth is, most influencers are not really getting paid, and only a very few are actually making a living at it. It’s parallel with the app world, where programmers got rich during the early days of the iPhone, but then latecomers found the market was saturated. Not everyone can be Angry Birds. Public relations agencies and marketers figured out a few years ago that people would trust the suggestions of subject-matter experts with large followings, and the more followers the better because people subconsciously equate status with expertise. This is the same phenomena that created spokespeople and celebrity endorsements. Clients actively sought out those deemed influential and showered them with budget, VIP treatment and perks. The problem is, the whole notion of paying influencers hundreds, thousands or tens of thousands of dollars to quietly endorse a product was all being made up as much of the Internet was, and little was quantifiable. As with any social network, the content creators work unintentionally as agents to stuff servers with media for venture capitalists to turn into a margin on their investments. Even if being an influencer provided a living for a chosen few early adopters (as it’s usually the first to a new social platform that gets the most followers), the chances of making a living have faded quickly over time. At some point, the venture capitalists flip a switch and the hip, ad-free community of likeminded individuals becomes an algorithm-based revenue stream. When the content found on the timeline (or stream or stories…) becomes determined by the needs of the social media’s sales team, the power of the influencer becomes diluted, just at the same point as creators rush in to make their killing. Those influencers I know with high follower counts have all seen interactions drop precipitously until there’s no more there. And I’m reminded of what Oracle founder Larry Ellison famously said once about bloggers: “Lots and lots of blogs does not replace lots and lots of sales.” Lots and lots of mentions from influencers also does not replace lots and lots of sales. But when an influencer talks about a product or a brand, do their audiences really trust them? Can one be sure that they aren’t just shilling? Maybe the influencer is chasing those perks—free trips to exotic locales, vacations, products or even a long-term gig. When people realize the influencer is really just a spokesperson, it doesn’t matter what the follower count is; they’re never trusted again. Earlier this year, I had convention-cocktail-hour conversations with “influencers” and social media creatives with very high follower counts. Some were struggling to make ends meet while still being flown around the world by brands and tourism boards. Many were hoping to kickstart a long-term career, but most would have settled for a portfolio full of content collected while the work lasts. A few will make it, most won’t, and that’s just like any genre creatives work in, including, film, music, podcasting and writing—or developing for the App store. So for the audience, integrity is still a huge factor, and the agencies working those influencers are only concerned with returning stats to their clients. These two don’t mix. In the November issue of Digital Photo Pro, we interviewed Instagram mega-star Dan Rubin, who rode his early beta invitation to Instagram to a sort of textbook influencer career. Even then, Rubin had already seen a change in the influencer world, saying “I’ve known people that [are] not trying to be photographers as much as Instagram consultants, helping clients build their brand’s Instagram feed.” (You can read the whole piece here.) The market has started to change as brands realize that influencers don’t have that much, well, influence. This looks like a typical social media influencer shot but this image from Ketron of the Intercontinental Resort in DaNang, Vietnam, was captured on a more traditional editorial assignment for Travel + Leisure. Landing advertising shoots is still the dominant way to get work in social media. In the past year, the FTC has begun to crack down on businesses paying influencers to promote products or services without disclosing that the mention is paid advertising. Last year the FTC started a massive crackdown on undisclosed advertising through influencers. Fashion company Lord & Taylor, gaming network Machinima, the gaming division of Warner Brothers and others were fined by (and later settled with) the FTC for not disclosing payments and payments-in-kind given to influencers. So influencers who are getting rich off their followings are few and far between, advertisers are starting to realize their campaigns aren’t as successful as they’d like, the social media networks are constantly fiddling to dilute the power of outside marketing money, and the FTC is cracking down on posting without disclosing the terms of the agreement. What’s a creative to do? There is a parallel in search engine optimization (SEO), the technique of posting content online so that it’s attractive to Google and other search engines in order to gain a high ranking. There are always marketers offering to teach SEO-boosting tricks, and Google is always tweaking its algorithms to circumvent these tricks. At the end of the day, the best SEO is just developing good, compelling content. That means that a photographer should concentrate on putting their best work forward, to whomever is looking at it on social media. But follower counts shouldn’t be the goal, nor should amassing a devoted following of fans so that advertisers take notice. The goal should be to create amazing work that naturally attracts viewers and be honest with followers about the role of money in commissioning work. Shauna Casey, a powerhouse in the Seattle-area tech startup community, told me, “A creative is the core to anything engaging or interesting.” Photographers are influencers, but that might not mean free trips to Iceland on the account of major travel or clothing companies anymore. So if being an influencer is not a viable financial model, is there any way for a photographer to make money while working with brands? She continued: “In my case, I have an agent who negotiates my rates and contract prior to shooting. Clients (or their representatives) approach me directly or through my agent with a particular project in mind. “The projects, usually called campaigns, can vary from being a single post on Instagram of a photo taken from my un-posted archives to a multi-week travel shoot with two or three posts per day as I’m traveling. Accompanying the post is a requirement to do one or all of the following in the post: mention the client in the caption, people-tag them on the actual image, geotag their space as the location, and use a hashtag or two. The goal for the client, when hiring talent like Ketron, is to reach her enormous following. A client pays her for access to an audience and the skills, her aesthetic. Because Instagram, via Facebook, offers metrics, they can count the likes and comments, and analyze the “insights” on the campaign. 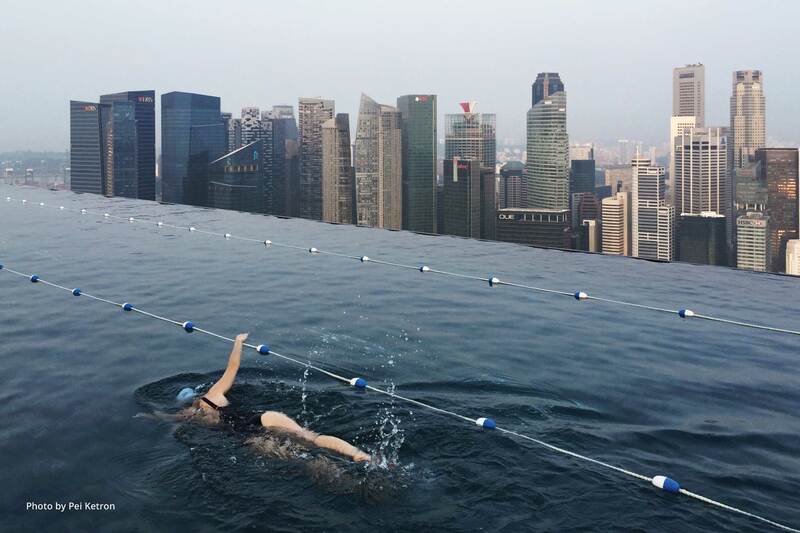 The photograph of the swimmer in a hotel rooftop pool by Ketron was taken as part of a week-long campaign for the airline ANA, meant to showcase some of the destinations to which ANA flies. Ketron has talent and influence, that’s a winning combination for landing client work. In other words, “influencers” like Ketron don’t simply amass followers and instantly turn that into cash; they have to work incredibly hard, just as they would to land to a magazine or commercial gig. The benefit, though, for these influencers is that unlike an editorial job, or even a domestic ad campaign, their work can be seen by potentially millions of people around the globe, and those ranks include art directors and creative directors. That means that chasing a career as social media influencer might be a misplaced goal, but by creating good work, generating large followings and actively seeking relationships with clients, it’s possible to use the social media clout to make one’s work more visible and demonstrate the ability to deliver in a world of instant gratification. A long-term career with reliable clients is better than a one-time, all-expenses paid trip to Belize any day.